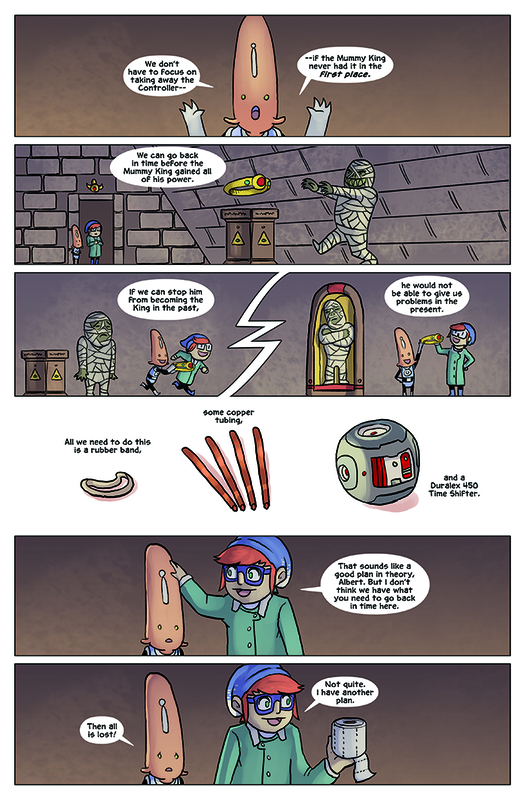 Albert comes up with a plan to defeat the evil Mummy King! I love love LOVE Gabe’s bobble head flashbacks. They look so cute and funny and exaggerated – everything you want from a ridiculous story (or plan of action). Thankfully, Gerty has a more grounded and realistic (and less complicated) plan that we will find out more about next update. So it’s 2015: the future! Back to the Future Part 2 took place in this year, and it’s amazing to have finally arrived (although I do wish hover boards, 80s-style fashion, and shoes that tie themselves were all common already…also, you know, flying cars would be awesome). So how was your New Years? Did you do anything fun? Leave a comment below and let us know what you’re looking forward to most in 2015!